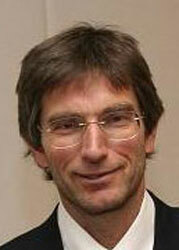 Tilman Ruff, an expert on immunization who consults with the WHO and the Australian Red Cross, is Co-President of IPPNW and former president of the Australian affiliate, MAPW. 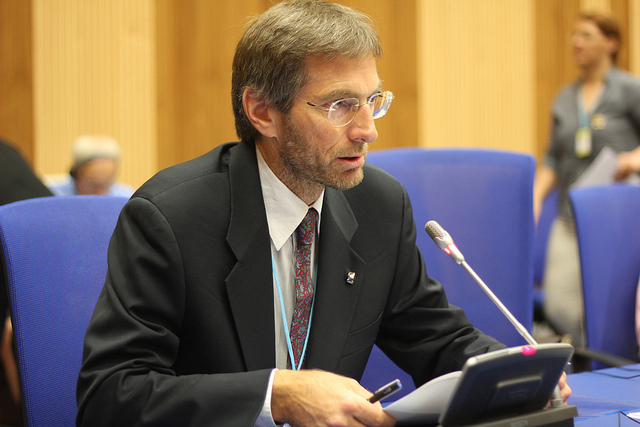 He serves as an IPPNW representative on the international steering committee of ICAN, and writes and speaks frequently about the need to ban and eliminate nuclear weapons. We asked Dr. Ruff how the prospects for nuclear abolition look from Down Under. Q: Australia is a non-nuclear weapon state that isn’t known for instigating armed conflict. So how did it happen that you and other IPPNW doctors from Australia are in the forefront of the movement to abolish nuclear weapons? TR: Nuclear weapons are a global threat. Wherever we live, it is now indisputably clear that if nuclear war occurs even on the other side of the world from where we live, every inhabitant of our planet is vulnerable to the impacts, from radioactive fallout to acute climate disruption and global famine. As the World Health Organization recognized in 1983, nuclear weapons constitute the greatest immediate threat to health and welfare. Therefore, we all need to take the nuclear threat to ourselves, to our descendants, and to all other life forms very personally. We have a duty to serve as custodians for life on Earth, not to jeopardize it. As physicians, we have the privileges of scientific and medical understanding and we live well-resourced and comfortable lives full of opportunity. These bring ethical responsibilities and responsibilities to act. Working in any area of public and global health requires collaboration and partnership, and we have been fortunate in the Australian affiliate, ever since IPPNW’s founding, to have a collegial group who support and encourage each other. Home to the longest surviving continuous human culture, Australia as a nation-state was founded by occupation and colonization. We still have no treaty with—or constitutional recognition of—indigenous Australians. Many in our mostly migrant population came to Australia fleeing war. But as a sparsely populated, largely settler society not well connected culturally with its geography, Australia has historically sought the protection of an imperial state. Initially this was Britain and, subsequently, the United States. Australia has therefore been quick and usually proactive in fighting in the wars of its protector state, from the South African Boer War onwards, including in the World Wars, Malaya, Korea, Vietnam and Iraq. Not many people know that Australia lost more people per capita in the First World War than did France. While Australia does not itself possess nuclear weapons, it claims the protection of US nuclear weapons, and is deeply and centrally enmeshed in a global web of surveillance, intelligence, command and control facilities that would play a key role in any use of US nuclear weapons in the eastern hemisphere, perhaps anywhere. This means that Australia is willing to threaten and be complicit in the use of nuclear weapons. Unfortunately, this reliance on “extended nuclear deterrence” also means that Australia is actively opposing and seeking to undermine progress towards a treaty to comprehensively ban nuclear weapons. Like other nuclear weapons-dependent states, Australia’s double standards are thus very much part of the problem of nuclear danger, contributing to continued proliferation and failure in disarmament. Australia’s current position is essentially to support disarmament once it happens, but not a moment sooner. How can you be serious about abolishing weapons you claim—misguidedly—are central to your security? We’re working hard to get Australia on the right side of history. Q: You participated in all three conferences on the Humanitarian Impact of Nuclear Weapons. How did IPPNW contribute to the success of those meetings? TR: IPPNW physicians played a vital role in all three of these landmark conferences, which were the first ever intergovernmental conferences focused on the actual impacts of nuclear weapons and the essential evidence that needs to drive policy around them. Ira Helfand, Masao Tomonaga, Andy Haines and IPPNW science advisor Alan Robock made seminal contributions on the medical effects of nuclear weapons, radiation health affects, and the implications for the global climate and food supplies of nuclear war. As all three conferences were fact-based discussions, authoritatively laying out the updated evidence around nuclear weapon effects, IPPNW’s singular expertise and focus as a global medical federation was a crucial underpinning. We also contributed, directly and through ICAN, to the development of the programs for the conferences and to large civil society forums that brought together campaigners from around the world. And, of course, many IPPNW members participated in the conferences. Q: Why does the evidence about the medical and humanitarian effects of nuclear war make such a compelling case for the prohibition and elimination of nuclear weapons? TR: The evidence about the health effects of nuclear weapons is clear and stark. The humanitarian conferences reinforced the conclusion that these effects are unequivocal and indisputable. More than 80% of the world’s governments, key UN agencies and international organizations, the Red Cross/Crescent movement, the large majority of experts and civil society organizations accept the evidence as it was presented. First, that any use of nuclear weapons would be an unmitigated catastrophe. Second, that no meaningful capacity to respond to even the effects of a single nuclear weapon detonated on a city is available or feasible, either locally or globally. Third, that the risk of nuclear weapons being used—whether by intention or otherwise—has been underestimated and is real, increasing, and persistent as long as the weapons exist. And fourth, that for these worst-by-far of all weapons there exists a legal gap—a lack of the binding legal agreements needed to prohibit and eliminate them. An aspect that was brought out during the conferences was that the more we learn about the effects of nuclear weapons, the worse it looks. An emphasis on the effects of blast and initial radiation in military assessments underestimates the greater effects on civilians and infrastructure of confluent fires including firestorms. Modern climate science has demonstrated severe, global and persistent climate disruption and agricultural decline from a miniscule fraction of the global nuclear arsenal, even if the weapons were detonated only in one region. New evidence shows that the long-term, transgenerational effects of ionizing radiation on health have previously been underestimated. And governments and international organizations have willfully neglected understanding key evidence on the implications of nuclear weapons for the security of their people and lands. For example as far as is publicly known, no government has yet commissioned its own analyses of nuclear winter and famine. It has depended on individual scientific leaders and organizations such as IPPNW to undertake this work. Yet this evidence is absolutely fundamental to informed policy. Nuclear weapons reductions to date have not materially reduced our peril. The evidence demonstrates that nuclear weapons cannot be used and must be abolished. Q: ICAN—which was launched by IPPNW’s Australian affiliate in 2007—is campaigning for a new treaty that would ban nuclear weapons and take a major step toward elimination. What will it take to get a ban treaty, how quickly can we get one as a result of this new HINW movement, and why do you think it would be a game changer? TR: I think this is the most exciting and promising time in the last 25 years since the end of the Cold War. We have had three landmark conferences, the third of which, in Vienna, produced the Humanitarian Pledge. More than 115 states have signed onto the Pledge so far, committing those governments to cooperate to fill the legal gap regarding nuclear weapons. The nuclear-armed states have failed to demonstrate any serious intent to fulfill their binding legal obligation to disarm; rather, they continue to squander the resources of current and future generations in massive investments clearly intended to modernize and maintain nuclear weapons for the long haul. And we have seen how bankrupt current tools and processes are, with the abject failure of the 2015 Non-Proliferation Treaty Review Conference. What we need to achieve a ban treaty is a core group of determined and courageous leading states who will grasp the nettle, supported and encouraged by global civil society. It will take countries free of nuclear weapons realizing that they can take decisive steps to fill the legal gap for the prohibition and elimination of nuclear weapons, even if the nuclear-armed states choose not to participate constructively. And then deciding that they will do so. Such processes are not new. Initially, a very small groups of committed states took the lead, despite the opposition of the most powerful states—also the major users and producers of the weapons—in developing the treaties banning landmines and cluster munitions. The states without nuclear weapons clearly cannot eliminate them. But they can establish an unequivocal moral and political norm and legal embodiment that nuclear weapons must be eliminated before they are again used. As we have seen with other weapons, such treaties can have profound effects, even on states that have not signed them. Countries could also back up a nuclear weapons ban treaty with strong domestic legislation prohibiting anyone under their jurisdiction from contributing to nuclear weapons development, deployment, threat or use in any way. They could also prohibit individuals and institutions within their jurisdiction from investing in companies producing nuclear weapons. They could end the production of fissile materials, eliminate them wherever possible, and put the rest under strict international control. There is a lot that states without the weapons can do, and the negotiation of a ban treaty could start within months and be accomplished within a few years or even sooner. Q: The humanitarian perspective on armed violence has been the key to achieving a number of important treaties in recent years. You mentioned the Mine Ban and Cluster Munitions Ban treaties, and the Arms Trade Treaty also comes to mind immediately. Why has it taken so long to ban nuclear weapons, and do you think we’ve turned the corner? TR: Yes, it is an important lesson that progress on banning most other types of indiscriminate and inhumane weapons has been possible when it has been widely understood that the effects of the weapons—which are inherent to their use—are unacceptable. The humanitarian imperative for their elimination has then trumped arguments about their political and military utility. Unprecedented investments in the development of nuclear weapons have resulted in vast government and military bureaucracies, research laboratories, and large corporations spanning the globe with enormous inertia and vested interests. Those responsible for these toxic and misguided dynamics are oblivious to the physical and biological realities that nuclear war would produce—not only mutually assured destruction, but also self-assured destruction and globally assured destruction. The arcane and abstract rationales for nuclear weapons—deterrence and some balance of weapons serving to prevent their use—have been fabricated to become completely detached from the flesh and blood realities that these are not bigger sticks or more powerful guns. In fact, they cannot be used. If and when the governments committing to the Humanitarian Pledge deliver on their promise, I believe we will have turned a decisive corner. We are now on the cusp. There has never been a more important time for clear, loud medical voices presenting and explaining the evidence to those who need to hear, and working in broad coordinated coalitions, such as ICAN, to bring the nuclear era to a healthy end.